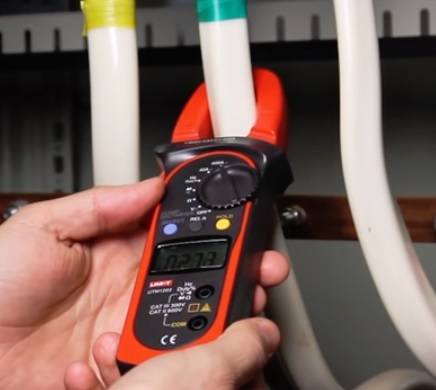 Having a multi meter with an amp clamp when troubleshooting a HVAC system is ideal when needing quick amp load readings. For example testing a condensing fan or blower motor for over amping can be done quickly by simply clamping one of the pole wires. There are many good HVAC amp clamp multi meters on the market with techs divided on the best brands. Personally I use a Fieldpiece HS36 that has an attachable Amp clamp and has worked great for many years. With the many brands available here is below is our picks HVAC amp clamp multi meters. If you need a low-cost amp clamp the Etekcity MSR-C600 is a cheap solution. It measure all voltages AC and DC as well as an amp clamp with a built-in display. It is not a top-of-the-line muilti metter but is good as a backup meter for a HVAC tech or for a home owner. The package comes with a small carry bag to help keep in protected when stored away. Fluke is a well know manufacture with many good multi meters. The Fluke 323 is a good unit that has a clamp to quickly and easily measure amps. It is also a True-RMS which means it is very accurate with readings. The Fluke 323 is a good unit that gets the job done. The Fieldpiece HS36 is an older Amp clamp meter that has been around awhile. It has an attachable accessory head that allows for an Amp clamp to be easily attached. I have used one for many years and it may be the familiarity but it is my go to unit. There are many more meters available with the Fieldpiece HS36 a dependable unit that has has always worked for me. The Klein Tools is a popular brand name with many amp clamp meters including the CL900. It has many nice features such as an analog bar graph and back light display. It is a TRMS meter which is good for accuracy. The UEi DL389 is a dual display meter with an attachable amp clamp. The clamp can be removed for easy storage and other attachments can be used such as a K-Type temperature probe. It has been available for sometime and a good unit for the price. There are many multi meters with amp clamps available in all price ranges. Many techs will have personal favorite with no single unit being the best. Fluke units are usually considered the top brand name but many other work just as well. HVAC service technicians are often divided when it comes to multi meters. Reading through the reviews on sites such as Amazon or forums is always a good idea to see if it is the right fit for you. Finding a good HVAC meter that helps you get the job done quickly and reliably is always the goal.